Santa letters, sparkly lights, Christmas carols; the holiday season is here! Then with a Ho-Ho-Ho, the festivities disappear as quickly as Rudolph, Dasher and Dancer. However, as a thoughtful hostess / mother / fill in the blank, you’ve got a surplus of Christmas goodies on hand. Packages of forgotten cranberries tumble from the freezer. Chocolate chips cascade from the cabinet. And that extra package of brown sugar stares at you from the shelf. Okay, so maybe Christmas feasts are gone until next year. But the merry certainly doesn’t have to disappear. The good news about being a thoughtful hostess / mother / fill in the blank, is that you can now make Chocolate Chip Cranberry Bars. The recipe is adapted from Sally’s Baking Addiction . 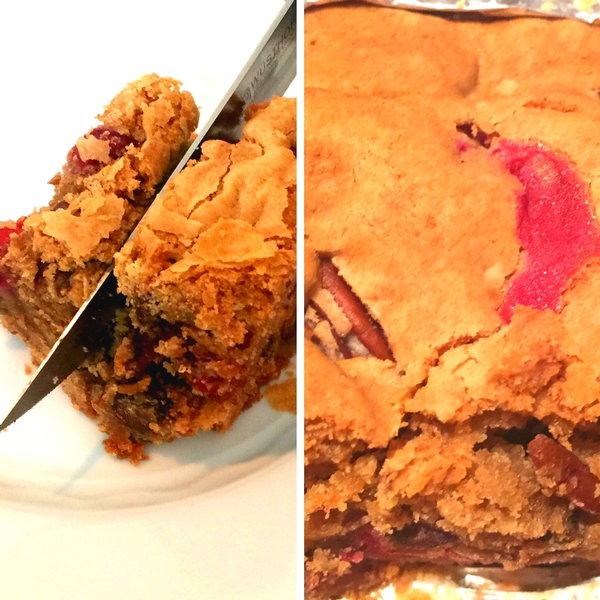 So all of my family and friends could enjoy, I made Glutenn-Free Chocolate Chip Cranberry Bars using Bob’s Red Mill 1-to-1 Gluten-Free Baking Flour. For the little ones, I stuck with semi-sweet chocolate chips. If you are minus munchkins, I’d recommend dark chocolate chips. Whether the chocolate is milk semi-sweet or dark though with this recipe you’ve got guaranteed smiles coming your way. The texture is soft yet thick and thoroughly chocolaty chippy! Wishing you time to savor the sweetness of the season. P.s. 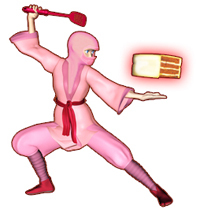 Speaking of sweet treats, BrandBallot sweetly declared NinjaBaker.com as one of the top 150 food blogs of 2018. Thank you, BrandBallot! Before or after Christmas, Chocolate Chip Cranberry Bars are a super-chocolaty cookie bar with a cranberry surprise. Perfect for bake sales, parties and Santa! This recipe is adapted from Sally's Baking Addiction . Preheat the oven to 350°F (177°C). Line the bottom and sides of a 9-inch square baking pan with aluminum foil or parchment, leaving an overhang on all sides to easily lift the bars out of the pan when cool. In a large bowl, whisk the flour, baking soda, potato starch, and salt together. Set aside. In anotherbowl, vigorously stir the melted butter, brown sugar, and granulated sugar together until no brown sugar lumps remain. Add the beaten egg and egg yolk. Pour in the vanilla extract. Pour the wet ingredients into the dry ingredients and mix together until combined. Transfer dough to the prepared baking pan and press/smooth into an even layer. Bake for 32-35 minutes or until lightly browned on the sides. Use a toothpick to test for doneness; if it comes out clean from the center of the pan, the bars are done. Allow the bars to cool in the pan for at least an hour. Once relatively cool, lift the foil out of the pan using the overhang on the sides and cut into squares. the refrigerator and bring to room temperature before serving. For a 9x13 pan: Double the ingredients. The bars will take longer to cook through, about 50 minutes at 350°F (177°C). Use a toothpick to test for doneness.